Thaniarasu Sannasi graduated from cohort 3 of the TNTA programme and he is now a Chief Officer with Pacific International Lines (PIL). A Diploma holder in Mechanical Engineering, Thani was previously working as a sales engineer in the electronic industry for five years but felt that working in sales had limited job prospects. In comparison, the TNTA programme has a clear and well defined training structure with progressive wage model. 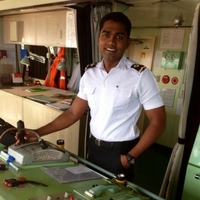 During the 6 months pre-sea TNTA programme, Thani would often speak to his TNTA lecturers who were former seafarers to learn from their seafaring experiences. This has taught him to make informed and effective decisions on-board the ship as an officer. Thani is now more confident of himself and is an officer whom others looked up to. Thani aspires to be a ship Captain one day. The occasional BBQs were always pleasant for Thani to bond with officers of different nationalities. He also enjoys watching the sunrise and sunset as it brings him closer to nature. Thani had to get used to working with shift timings and dealing with fatigue. As he is away from home for long periods, he feels homesick at times. Nonetheless, his unwavering passion for the sea did not deter him from pursuing his dreams. While sailing, maintaining order among the crew and taking care of everyone’s welfare is the main priority of an officer and Captain. There will not be any fire-fighters or police officers to call for help onboard the vessel. Therefore, everyone has to play their part and work together as a team. Communication barriers with people of different nationalities may delay work processes. It is also not easy to work with crew from different countries and working habits. But through his sea time, Thani developed better interpersonal skills and is able to interact well with his team. He could not emphasise more on the importance of respect for your shipmates, regardless of their ranks.